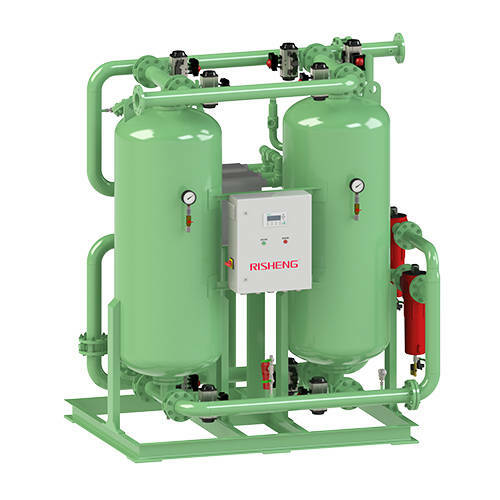 Supportive Ceramic Balls used at the bottom of adsorption tower make uniform air-flow distribution , in this way ,desiccant can be protected from soaking and also get longer service life , together with special designed stainless steel flow divider , pressure loss can be greatly reduced. Special designed high performance desiccant can get best dew point. Famous blower is with reliable performance and low energy loss. Pneumatic valves are made by special materials with superb thermostability , by using double activate solenoid valves ,the reliability and service life can be greatly improved. Standard configuration is using high efficiency oil-removed and dust-removed filter for pneumatic valves. Standard configuration is using 304S stainless steel for pneumatic piping line. Standard configuration is using reliable PLC controller. Optional Siemens and ABB brand PLC or touch screen and etc. We can meet various customer requirements for communication, connecting RS485 I/O , Profibus or Modbus to Ethernet. LDCS-Load Dependent Control System ensure the case that performance is best and at the meantime to control the purge air loss accurately , compared with fixed cycle time control type ,LDCS could save at least 8% comprehensive energy consumption. DPOS-Dew Point Operation System can delay adsorption time under unstable load, DPOS could save at least 75% comprehensive energy consumption.